Typically in films of the "inspirational teacher" genre, the celebrated, unconventional instructors that inspire their pupils to reach greatness do so by kindly reaching out to their young students, instilling in them a lifelong love of learning through their sheer passion for teaching. In "Whiplash," Terence Fletcher, the tyrannical music teacher played with gleeful relish by J.K. Simmons, motivates young jazz drummer Andrew Neyman (Miles Teller, "The Spectacular Now") by hurling a chair at his head, repeatedly slapping him across the face, and berating him to tears while screaming about what a worthless piece of s**t he is. "Dead Poet's Society" this ain't. In telling the story of this obsessive mentor-protégé relationship at the most prestigious music conservatory in the country, writer-director Damien Chazelle (expanding on his short film) asks us to consider whether the abuse that we witness is necessary in order to attain greatness. Andrew aims to be a legendary musician -- the next Buddy Rich -- and as the torment he faces at the hands of his teacher pushes him beyond anything he thought possible, it's clear that he improves as a drummer. The mental and physical torture, along with the deterioration of all personal relationships is collateral damage, the price Andrew pays in his pursuit of perfection. He sacrifices in both his relationship with his supportive father (Paul Reiser) and his burgeoning romance with Nicole (Melissa Benoist, quite good in this small but crucial role). For all he goes through, there's always the very likely possibility that perfection will remain out of reach, and the path toward it will destroy him before he ever reaches the end. Whether that's psychotic or brutally honest is left for us to decide. In his motivational tactics, Fletcher demonstrates behavior one would hope is at least slightly exaggerated, though I'd be curious to ask an Eastman student how closely certain scenes resemble what happens behind closed doors at a highly competitive music school. There is one incident at a point in the film's second half that stretches the bounds of believability, but for the most part the film feels real, and that's what's most important. If nothing else, the film is unsentimental about the more punishing aspects of being a professional musician. It requires blood, sweat, tears, and (in this case) even more blood. Chazelle has a background in music and his love of the art form shows. He shoots jazz sequences like electrifying action scenes -- intense and thrilling, always echoing the rhythm of the film's jazz soundtrack. But his real secret weapon is in Tom Cross' editing. Cross' precise, stunning work gives the film its constant, propulsive energy and perfectly complements the sound editing that gives it an endlessly percussive beat. J.K. Simmons is terrific in a showy role, portraying Fletcher with a terrifying fury that never becomes cartoony. He's just as frightening during his calm moments as he is at his most ferocious. 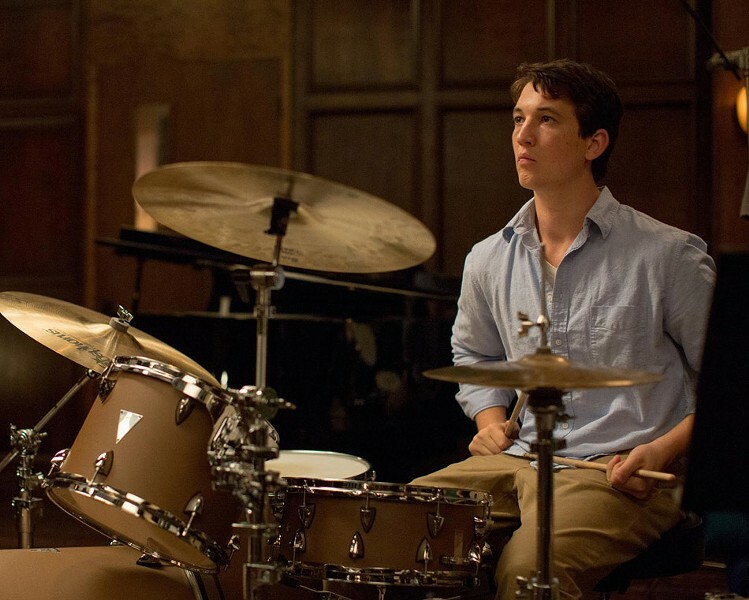 Miles Teller (performing much of his own drumming) is remarkable. Downplaying his natural charisma, he's unafraid to make Andrew unlikeable and even worse, as his driven nature teeters over into obsession. It's truly a high compliment to say that he holds his own against a force of nature like Simmons. "Whiplash" has been jokingly referred to as "Full Metal Jazz Band" and that's not very far off. In examining the cost of perfection in a way that's equally affirming and cautionary, the film is disturbing. Is Terrence Fletcher a great teacher? A Sociopath? Both? The film's refusal to provide us with answers to those questions gives it a dangerous, unpredictable beat all its own.